The online job market is like a river ripe for fishing. However, as a hiring manager you’re only interested in catching the best fish possible. The internet has allowed hiring managers access to a much larger talent pool than before, but that also causes problems when you don’t know how to sift through that pool to find the best candidates. Not to mention that time is of the essence and you don’t have the luxury of reading each resume thoroughly. So what is a hiring manager to do? We’ve outlined 10 quick-and-easy steps to follow in order to develop a shortlist of candidates to interview. After all, the end goal of the resume review process is to interview candidates to really dig into the details. You already know how many years of experience the company requires the candidate to have, and it should be the first bit of information that jumps off the page. If the candidate hasn’t told you exactly how many years of experience they have, glance through their professional experience and add up the numbers. The candidate’s academic background is most often outlined either at the beginning of the resume or at the end. If you don’t see it right away, flip to the second page and you’re likely to find it at the bottom. A plethora of positions require technical competencies with the digital age that we live in. If you specified technical skills in the job posting, they should be listed on the resume. What has the candidate been doing most recently? What is their current job title and how long have they been in this role? These are the three basic questions to answer when glancing through the candidate’s experience. This is one of the most important steps. Has the candidate only listed job responsibilities, or have they actually made a difference within the company where they were employed. You want to ensure the candidate is up-to-date with industry terms and keywords. You would’ve included the main keywords in the job posting, and so you should see them mimicked in the resume. Candidates who really want the job will ensure to include information about the company in the cover letter. It is important to find a candidate who not only fits the job description for the role, but will also be a good fit within the company culture. The candidate has passed steps 1 through 7 – now it’s time to get a deeper understanding. You’ve already reviewed their most recent role, now it’s time to see the evolution of their career by examining their earlier roles. The key is to look for progression – you want a candidate who has proven their worth by receiving promotions internally or externally. For candidates who have been out of school for a few years, you want to see that they’ve made the effort to keep their skillset sharp. Look for internal or external training courses or certifications. You want a candidate who takes this type of initiative. Finally, the last step is to review their community involvement. 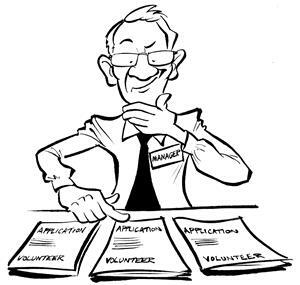 Does the candidate volunteer, do they give back to the community, do they have a work-life balance? Just like Step #7, you want to make sure the individual is aligned with the company culture and if your company places a large focus on these initiatives, you know the candidate will fit right in. Use this 10-step format to help you narrow down the right candidates. If a candidate fails to pass one of the steps, don’t continue. Put that resume in the “No” pile and move on to the next. If the candidate makes it through all 10 steps, move them to the shortlist. Last but not least – be picky. Your company only wants to hire the best possible candidate for the role. About the author: ResumeTarget.com provides professional resume writing services for clients of all career levels across North America. We are the only resume writing company that offers a professionally written resume coupled with the guidance of recruiters, to guarantee that your resume will get results. If you’re looking for guidance, submit your resume for a free review today. These are great tips. I like # 7 especially. The candidate must know something about the company and it should be evident in the cover letter. The candidate who has taken the time to write a strong and persuasive cover letter will know this. On the other hand, the job seeker who is sending out resumes with generic cover letters has, from the outset, not demonstrated much commitment to his or her own job seeking process much less shown how he/she could be of benefit to a specific company. Thanks Phyllis! So many job seekers choose not to tailor their cover letter simply because they don’t like writing cover letters. The ones who are truly interested in the role will make the extra effort. Yeah as mentioned in a previous comment, tailoring the covering letter (and/or resume) is always a good piece of advice! Excellent tips ! Quite comprehensive , I am nut for interviews . I get flustered and nervous when am in one . The last interview i did , I cried when it finished. The job was mine in the end , but because i was so desperate the interview broke me down. Preparation is key to any interview and these are all key point. The interview process is incredibly nerve-racking to say the least, and on top of that – interviews are getting more comprehensive than ever. Candidates are now being put through skill testing, personality tests and multiple interviews with different members of the hiring team in one day. We completely agree Nivlac – preparation is key! Did you actually cry in the interview, or once it was over and you’d got out and back into your car? I know the feeling well! Yes I actually cried, not for long though . The interviewer asked me if I was OK. I really needed a job. Its not good practice though. Accomplishments can be two-sided. Someone may simply lie about what they have done, or changed the emphasis so that they take credit for things they shouldn’t. I would try to verify this area with calls to ex-supervisors and the like. You’ve brought up an important point Larry. Many Hiring Managers opt to ask for references after the interview, but by asking for them beforehand you can verify information like this ahead of time and save yourself a wasted interview. i would agree thats a really creative way to find out who is up to the task . Thanks Nicola, sometimes the more creative the solution the more effective it is! Point numbers 9 and 10 are so valid. I have experience with many individuals, who think that their learning is over as soon as college is done with. They don’t realize that their learning starts with every job and every activity they take up after that. Also, I personally look for leadership qualities by asking candidates about their community involvement. This is so because, if a person can find something to do in his free time, as also motivate himself to do it, then he has some essential leadership qualities. I definitely give such individuals a plus. Thank you for your post! It really is helpful! I’m glad you liked the post Oivas, and thanks for the great feedback! Wow, I have been guilty of so many of the points that you have just pointed out, and I always wonder why I am never called in for interviews 🙂 Thanks for sharing and I sure will share this article with some of my friends, it will go a long way in helping them get hired. Thanks Carl! Always nice to know that our articles are helping our readers. Now that you know what to fix, I’m sure you’ll see an improvement in your job search tactics! Good points cited! It made me rethink about my current resume, since I am not in a position to hire right now. When I went through this article, I realized I’ve taken my resume too lightly. I should spend more time on building my resume. I have been frustrated these past days because companies won’t hire me. Maybe, it’s because I have not represented myself well in paper. Thanks for the tips! Thanks Hannah, yeah often a resume get’s ‘thrown together’ quickly when you need to find a new role, instead of actually taking the time to craft it properly. The biggest issue for a hiring manager is trust. A resume is rarely 100% accurate even when presented by an honest individual. Few people remember the exact date that they began a former job for instance. They might have filed that information in their employment information somewhere, but few remember it exactly. I once ran a small business and prior to selling it in order to try new things I had to be my own hiring manager, as most small business owners tend to do. I ran through so many applications and resumes that seemed amazing only to find out that the individual who showed up to the interview was unable to even tell me what my business was about. One particular individual had cited having five years of management experience in a small retail business. His supervisor turned out to be his father. They sold things at a local flea market. Not a bad gig, but not quite what I was looking for at the time. Scottf14, wow, that’s quite something. Sounds like you had quite an ordeal in hiring people, and all because they were so terribly inaccurate — and even misleading — with their resumes. But beyond that, it’s highly irresponsible and unprofessional. If a candidates can’t honestly and accurately represent themselves, then what does that say about their potential value to a business that is seeking to hire them? It’s unfortunate that people are still doing this. They are wasting business owners’ time as well as their own with such “enhancements” of their resumes. If someone really does have limited experience and they are serious about pursuing a certain career path, they should make the commitment to start at the appropriate level, and be willing to work their way up. That is the problem exactly. I can overlook a little ‘fudging’ on an application. Outright lies are another story altogether. If you don’t have the knowledge or experience to do a job it can only hurt you in the end. You’ll waste your time at a job that you will not be able to keep when you would have been better off applying to a job that you had to capacity to perform well. It is better for everyone, overall, just to be honest. You’ve brought up a great point Scott, especially coming from the perspective of a hiring manager. So often we hear the complaints of how hard it is to get hired, but job seekers rarely see it from the viewpoint of a hiring manager who knows how hard it is to find and hire the right people.